Hi! I'm here to share a card, and hopefully, inspire you to join our new challenge for this week over at Addicted to Stamps & More. I was pretty excited to make this week's card because it features one of my favourite themes : Clean & Simple! Anyways, hope you like it! On this card, I've used WPlus9 Basic Banners stamp set for the sentiment and banner and A Pocketful: Valentine's for the cute lollipop image. Thanks for stopping by and don't forget to submit yours! Click the banner below to get to the challenge site and check out the cards made by the rest of the team. 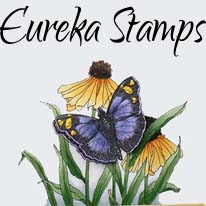 And the best part is, the winner gets not 1, not 2 but 3 free digital images from our generous sponsor, Eureka Stamps! Those lollipops look cute! nice card Marina! Sweet lollipops make for a super sweet card! CAS-delightful!! Love the texture and the super sweet coloring you used! Hi Marina, this is so eye-catching! I love the lollipops and your card is coloured beautifully. Such a great card, I love the colouring of the lollipops and the sentiment really makes it pop. I didn't get chance to comment last week (holiday), but I had to pop by. I do like those lollipops - such pretty colours! Love the sentiment banner too!